At eHealthWeek UK Anže Droljc of Marand will talk about how healthcare IT should address the complexities and opportunities of healthcare today and how Better by Marand’s medication management system – OPENeP is leveraging the Postmodern architecture. Along with innovation, cloud based deployment and integration of things, agility is the main differentiator when describing the requirements of application architecture for the Postmodern EHR. 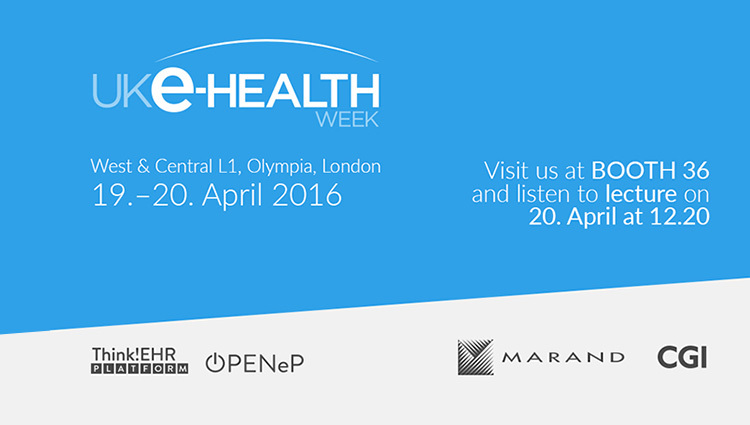 Come and join the talk at eHealth Week UK in London on 20th April at 12.20. Gartner Group recently declared a new phrase to describe IT systems' transition from monolithic systems to multivendor environments. Monolithic systems were primarily designed to provide organisations with transactional efficiency and data integrity. That was fine in the times before the advent of smart phones, tablets, online sensors, wearables and other data sources that are affordable, appearing out of nowhere and ubiquitous. Old monolithic systems don't play well in this new digital world, which is why a new architecture is required, one that is agile, open and responsive to hundreds of new needs of users. Healthcare IT is in the same transition. Mr. Droljc will discuss what healthcare providers and vendors can do in order to be more agile and open, while at the same time make sure the IT systems, apps and solutions are built to support longevity and integrity of patient data. Proper management of healthcare data that is standards based, vendor-neutral, open, with universal connectivity to any other standard abiding apps is key to these new types of EHRs. Mr. Droljc will show why openEHR is a crucial piece in Postmodern EHR architecture, while Marand’s own Think!EHR PlatformTM built on openEHR is already the cornerstone of many state-of-the-art EHRs around the world today. One such application is OPENeP - a comprehensive, user-friendly and innovative medication management solution that has been developed in close collaboration with University children hospital Slovenia and localised for UK in collaboration with the NHS England Open Source community and several other NHS trusts. It is designed to completely replace time-consuming manual paper based prescribing and medication administration. OPENeP significantly improves communication between physicians, nurses and pharmacists. It enables creative use of data, helps work prioritisation, provides reports to reflect-on and optimise established workflows. It's extensive feature list, integrated decision support and powerful integration options are designed to empower doctors, nurses and pharmacists to improve patient safety and deliver better and more personalised care.